Your young mechanic will get a kick out of being able to put together his own toys for once! 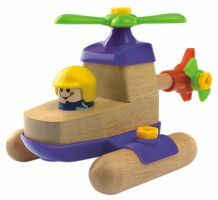 Designed with young fingers in mind, this kit has large screws and a child friendly screwdriver - the 'pilot' of the helicopter does double duty as a tool. Best of all, it can be disassembled later, so little mechanics can put it together over and over again! Want more assembly fun? Try Build A Train or Build A Racer!